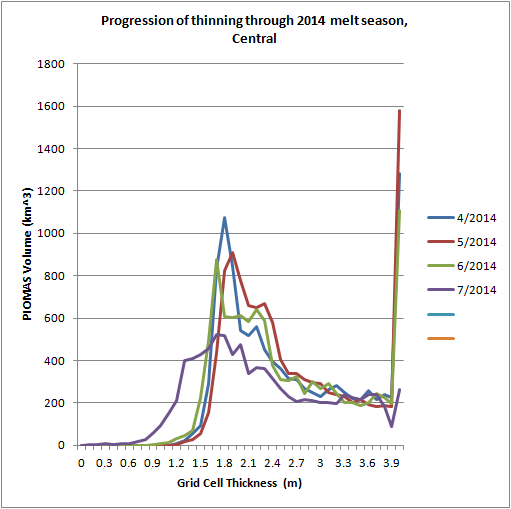 In my last update on PIOMAS I showed how despite 2014 having a spring melt, the spring melt had been curtailed. This suggested that volume by the end of July would be high because after each spring melt anomalies rise. However the rise of anomalies has been rapid this July (more so than I had expected), implying seriously below average losses of volume, this may continue into August and the final August volume figure may show an even greater August volume when compared to other years in August. Failure of melt against a climatological background of melt could result in a surprisingly high minimum volume at minimum, even give the surprise of July's volume. No, I am not making any guesses, at this stage I'll just wait to see what happens. 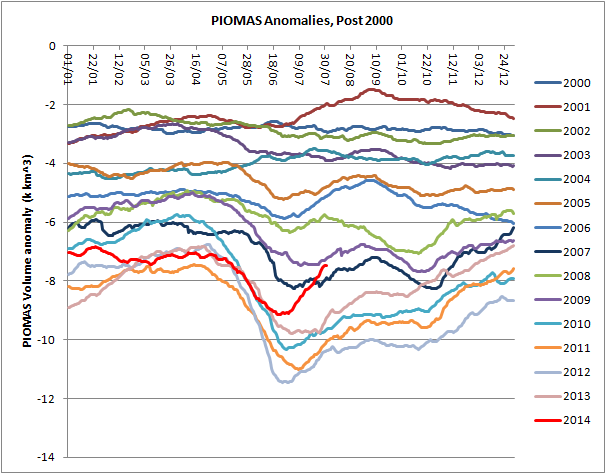 The above plot of regional volume shows that in the PIOMAS model the volume increase has been limited to the Central Arctic region, it is hard to make a case for increased volume in other regions. Notably the Central Arctic volume is now back to levels last seen in 2009, before the volume loss of 2010. Taking the gain of volume from 2012, most of this is accounted for by the increased volume in the Central region. Turning to average thickness for the regions of the Arctic Ocean, from Beaufort through to Kara, and Greenland, thickness is only of the same order as the post 2007, or post 2010 average. Barents is above average for recent periods but the extent in Barents is low and this accounts for very little of the overall volume increase. It is in the largest region in the sense of both volume and extent, Central Arctic, that we see a marked increase in thickness, the Canadian Arctic Archipelago (CAA) also contributes to this. It is worth pointing out that Central Arctic thickness in July 2014 is 2.051m, in July 2009 it was 2.052m, the law of large numbers (or large sets of numbers) continues to amuse. 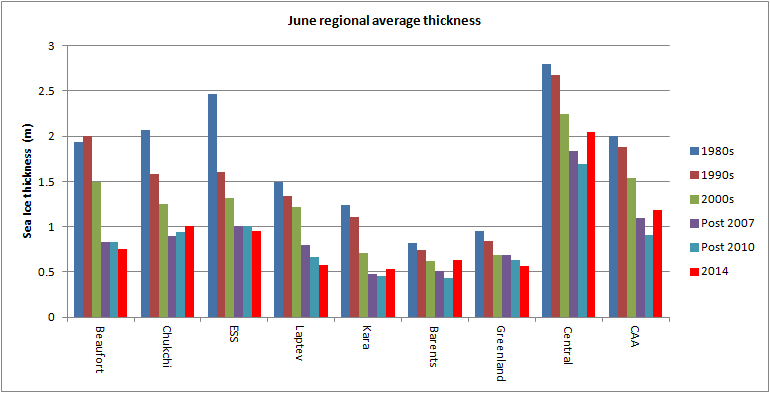 Looking at map-plots of thickness July 2014 is seen to be more similar to July 2009, than to July 2011 (for example). However note that the thickness outside the Central Arctic was higher in 2009 than in July of this year. Note also - those are plots of thickness down to zero, so even tiny grid box thicknesses implying dispersed ice are included in the plots above, hence the unrealistic ice edge. 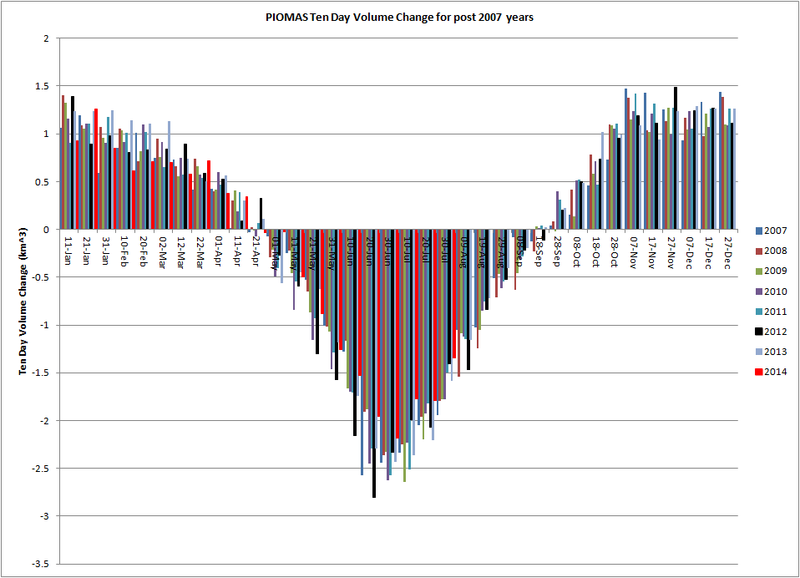 Before I move on to the regions, what has really surprised me is in the rate of change of PIOMAS volume, which I calculate in ten day increments. The changes for 2014 are shown in red, note that the decline from the 1 July to 10 July is virtually the same as the decline in volume for the period 11 July to 20 July, when the overall shape of the curve suggests that typically the earlier period should show a greater decline in volume than the later. It looks like something was happening in early July that seriously reduced the volume loss one would expect for that period. At that time high pressure dominated and temperatures were about average for the 1981 to 2010 baseline used by NCEP/NCAR, in other words, cold for recent years. Now for the regional breakdown. 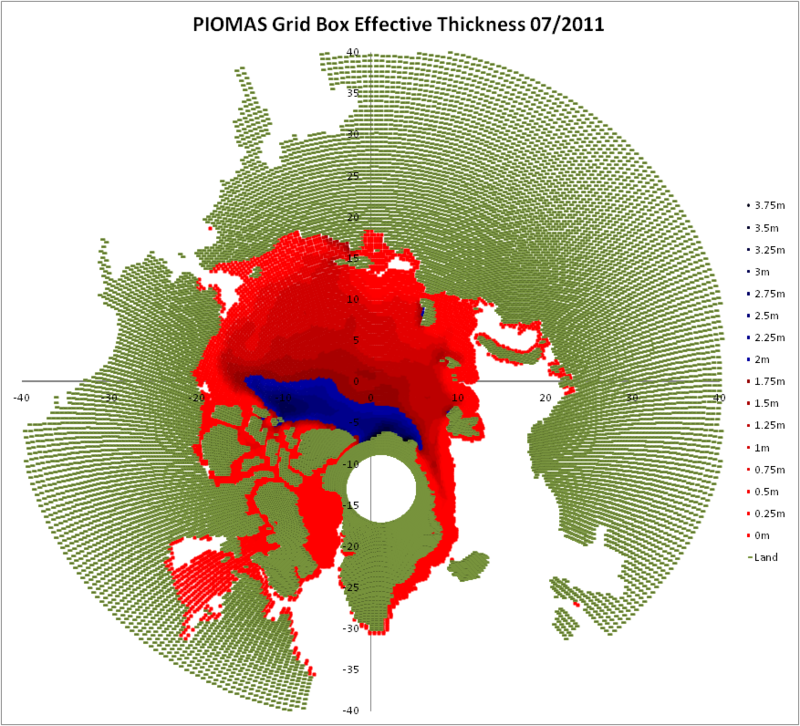 Volumes in ice from grid boxes with thickness of 0 to 2.9m shows little change from previous years, the longer term patterns of change are preserved in such ice. However the same pattern seen in Central Arctic volume in the first graph of this post is repeated here in the 3 to 3.9m thick band. 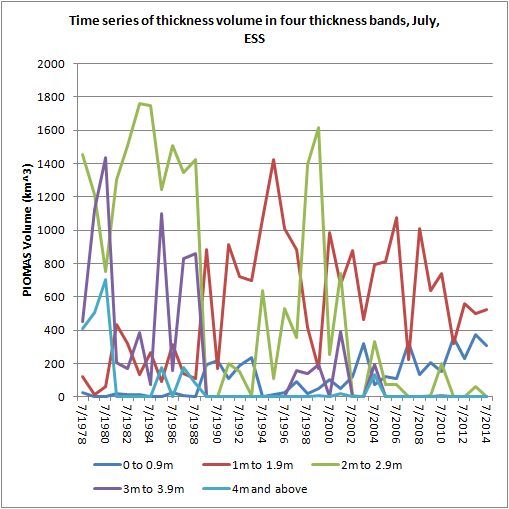 Volume from the thickest ice, >4m thick, has risen slightly but remains very low in the long term context. 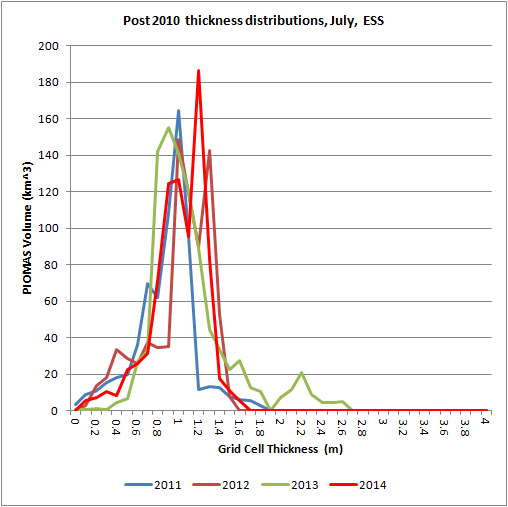 The progressive change of volume/thickness profiles shows the sort of collapse typically expected in July, however in comparison to other post 2010 years (see below) there is a lot of volume above 2.7m thick that does not decline significantly as the melt season passes. 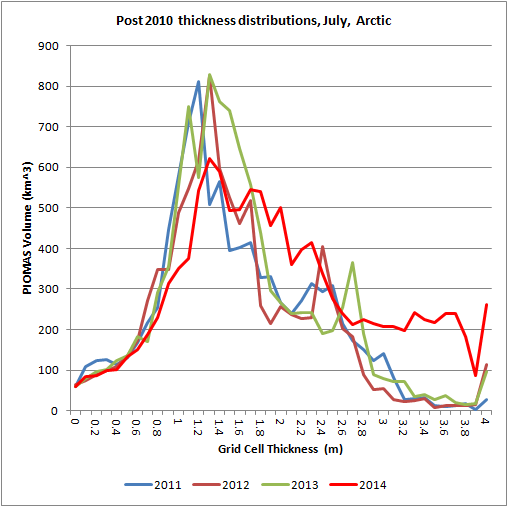 Comparing July 2014 with other post 2010 years shows a similar distribution below around 1.6m thick, with an increasingly unusual amount of volume for thicker ice. 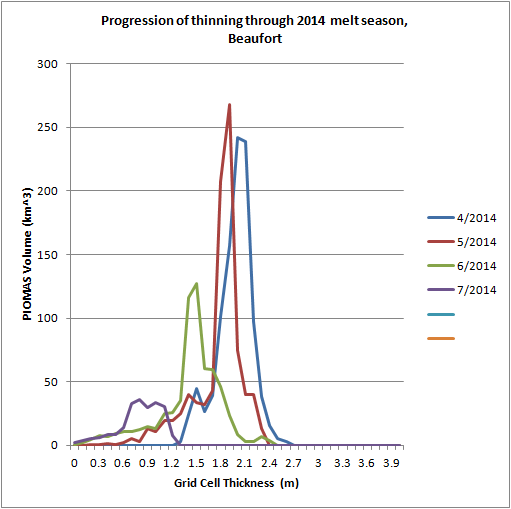 In Beaufort the PIOMAS data shows that conditions are fairly typical for recent years. Certainly this is not like July 2013 in Beaufort. 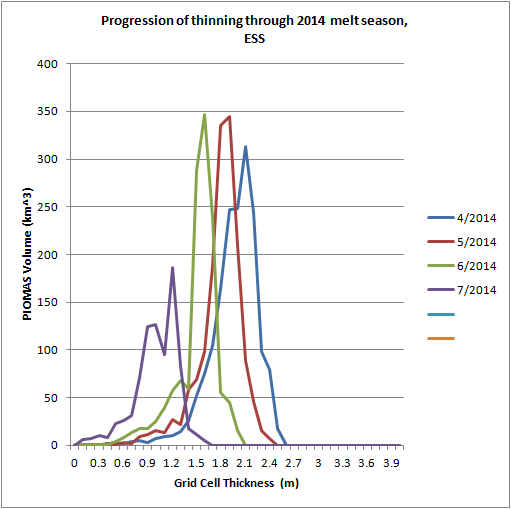 The progression of melt is normal from April to July, as is to be expected for July the mono-modal peaks of first year ice in April, May and June collapse as thinning occurs at different rates smearing the distribution of volume with thickness. 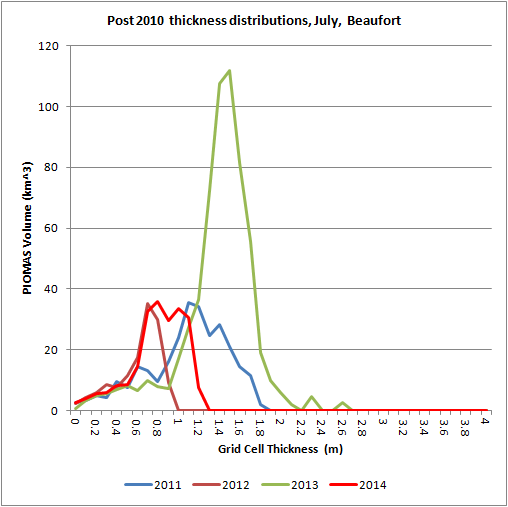 Comparing thickness distributions with other post 2010 years reveals that 2013 was very different to the other years and that in Beaufort PIOMAS finds conditions relatively normal for recent years. Once again the ESS shows no indication of increased volume or thicker ice. 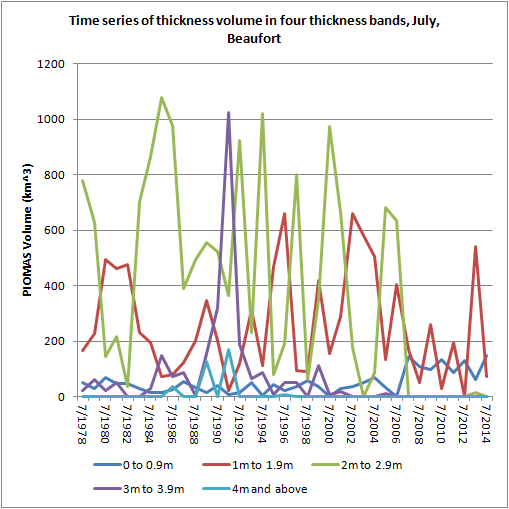 Volume in the 1 to 1.9m band is similar to recent years while volume in the 0 to 0.9m band continues to increase as summer ice thins. 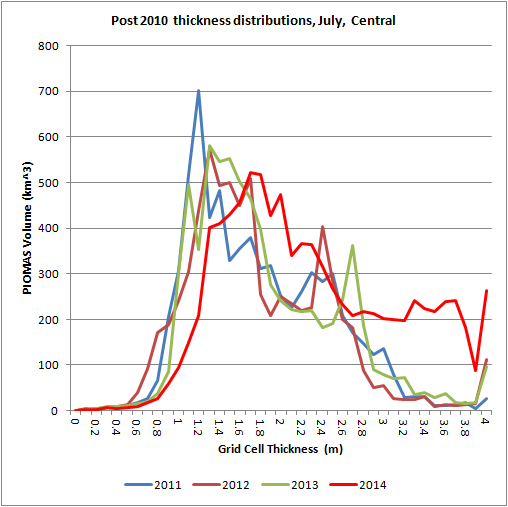 Thickness distribution normal compared to recent years, no big slug of thick ice. However at this point it is worth noting that PIOMAS doesn't explicitly model first year and multi year ice categories. I still think there is multi year ice in Beaufort, Chukchi and the ESS, I still think that will delay melt. It's just that PIOMAS doesn't pick it up and models ice properties based on the effect of thermodynamic and mechanical growth of thickness on the thickness distribution. While the rest of the Arctic Ocean is fairly normal for recent years the Central region is not. Ice thickness of 1 to 1.9m and 2m to 2.9 continue to mirror each other, when ice is thinner it falls in to the former band, when thicker it falls into the latter band, and as ice moves between the two bands their progression of volume mirrors each other. 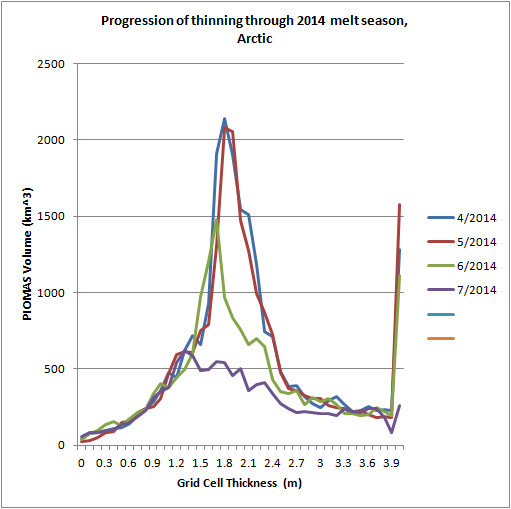 This year more thinner ice volume is thicker and has fallen into the 2m to 2.9m band. Looking at ice of 3 to 3.9m thick, once again we see the 'bucket' of 2010 to 2013, delineated by higher volume in 2009 and 2014. 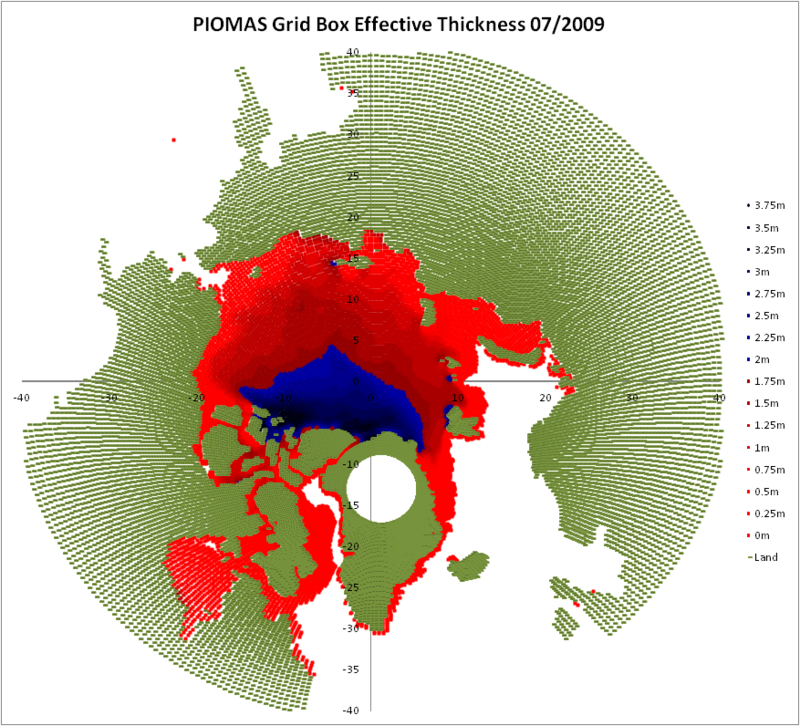 Note that the 'bucket' in the Central region is about 2k km^3 deep, similar to the depth of the 'bucket' in the 3 to 3.9m ice of the first graph of the 'Whole PIOMAS Domain' section above. Taking the overall volume difference between July 2012 and July 2014, in the Central Arctic the overall volume difference between those two months is 2.072k km^3, for the Arctic Ocean the overall volume difference is 2.633k km^3. Therefore the Central Arctic accounts for 79% of the volume increase since July 2012 for the whole Arctic. 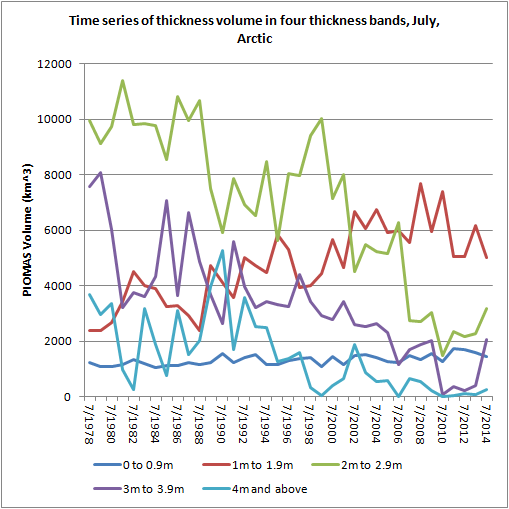 Of the 2.072k km^3 increase between July 2012 and July 2014 in the Central Arctic, 88% is from ice between 3 and 3.9m thick. Taking the Central Arctic's balance of 79% of the total gain in volume between July 2012 and 2014, Central Arctic ice between 3 and 3.9m thick accounts for 70% of the total volume increase between those two years. The volume increase is not only confined to a specific region, but within that region it is confined to a specific thickness band. 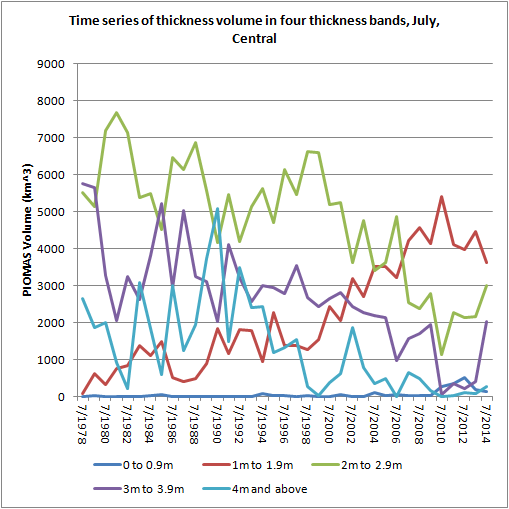 The July collapse of thickness profile is never as marked in the Central region as in the peripheral seas of the Arctic Ocean, however this month it is clear that a large amount of thicker ice holds volume up. This is even more clear comparing July 2014 to the other post 2010 years, above 3m the difference is striking. The cool weather and poor melt seasons of 2013 an 2014 have put us back to pre 2010 total volume. However it is far from clear that the overall state of the pack has reverted to pre-2009. This does present a nuisance to me. I recently posted that I had changed my mind and that for specific reasons unrelated to this increase in volume I now expect a seasonally sea ice free state not to occur until later in the 2020s, possibly later. The events of this year and the last make no difference to that expectation. But it looks like I will have to wait several more years before I can again start counting down the years that April volume floors at the level I expect. However another way to look at it is this: We've seen volume around 19k km^3 (that which would be expected for a mostly FYI pack) from April 2011 to 2014, if this volume pulse takes several years to work through the system and then we see a new levelling of April volume to around 19k km^3, with the intervening disturbance it should be a strong indicator that we don't face a fast crash, but that we face a slow transition. I can't remember if I mentioned this previously, but I have seen very thick snow pack on sea ice in the Barents. They took me for walks on the Ice, and I remember I would punch through the ice crusted cover laying on top and then fell in all the way to my waist. So I was wondering if the higher humidity may not be causing more snow? That snow on the pack would help preserve it, wouldn't it? Do you have ship expeditions sailing along the ice age, going in 10 to 20 km and taking cores to see what it looks like? I'd been wondering the same thing. But Steve on the forum sent me a paper: Webster et al 2014 "Interdecadal Changes in Snow Depth on Arctic Sea Ice"
37 ± 29% in the western Arctic and 56 ± 33% in the Beaufort and Chukchi seas. Thinning is negatively correlated with the delayed onset of sea ice freeze-up during autumn." "... Snow depths in April on Arctic sea ice decrease over the 21st century in RCP2.6, RCP4.5, and RCP8.5 scenarios. The chief cause is loss of sea ice area in autumn and, to a lesser extent, winter. By the end of the 21st century in the RCP8.5 scenario, snowfall accumulation is delayed by about three months compared to the late 20th century in the multi-model mean. Mean April snow depth north of 70°N declines from about 28 cm to 16 cm. Precipitation increases as expected in a warmer climate, but much of this increase in the Arctic occurs as rainfall. The seasonality of snowfall rate grows, with increasing rates in winter and decreasing rates in summer and autumn, but the cumulative snowfall from September to April does not change. Kurita 2011 GRL "Origin of Arctic water vapour during the ice growth season." use isotopic signatures to trace the Autumn emission of water vapour from the open water we've seen in recent years. This is detected in Siberia and may play a role in some very rapid snow advance events. So it seems that whilst water vapour has increased, snow thickness is less due to later formation of ice. It could present a negative feedback to a year like this - the greater extent of thicker ice could support more early snow and deeper snow by April. This would insulate the ice and reduce thermodynamic thickening over winter. O-Buoy #10 seems to have had no net loss of snow depth between July 17th and August 1 due to snowstorms passing through and the surface albedo was elevated. Might this explain the July volume anomaly surge? And the early July part could be explained by snow just north of the Beaufort Sea around June 25th? It seems the surface darkening in that area stalled on MODIS. Melt was well under way by June 24th but the surface was still fairly white on July 5th. I take it that was also a big snowstorm that kept the surface albedo from dropping like it normally would. Relative to average, both precipitation and cloud cover have been reduced over the Arctic basin this summer due to higher pressures/warmer temps aloft. However, without the tight pressure gradients reminiscent of the 2007-2012 dipoles, we've seen a lack of vertical mixing, hence a notable temperature inversion, which further reduced mixing/wind at the surface, with the cells being confined aloft. I'm baffled by the slowdown in volume loss, particularly the inflection in the anomaly trace. Relatively low heat advection into the Arctic from lower latitudes is probably a major cause of the slow melt this season. However, that cause does not explain why the departure from recent years' volume trend is mainly in the Central region, nor your observation "...there is a lot of volume above 2.7m thick that does not decline significantly as the melt season passes." 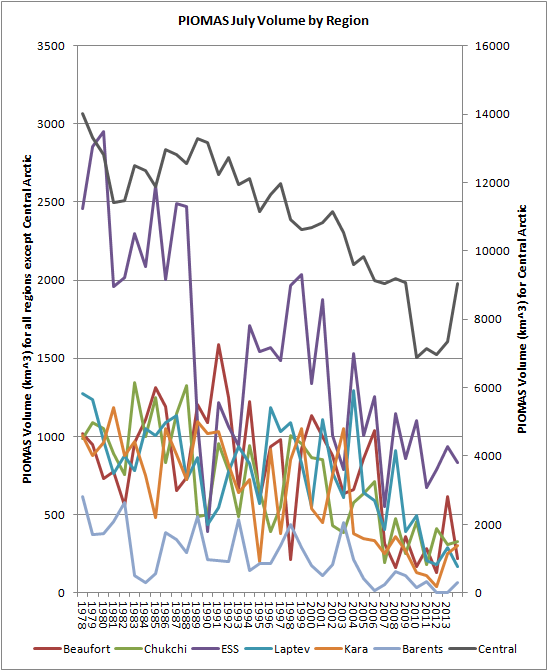 It's probably significant that the volume anomaly begins to depart from the 2010-1013 curves in early June - but why? The temperature anomaly north of 80* dropped around the same time, but the gap narrowed soon after. Wipneus says in the ASIF PIOMAS thread that compactness (which is relatively high this year in the Central region) is a factor is several ways. I suppose compactness is both a cause (higher albedo) and an effect (slower start to melt pond formation, less dispersion of ice by winds owing to lower pressure gradients) of slower volume loss. Maintaining my guess that volume will drop more than extent in the next month or so - again, relative to recent years. Just so you all know I'm not ignoring you. I'll reply tomorrow night, it's been a long day after a long week. I've been suspecting inversion as a factor this year, the high pressure centred on the pack rather than the dipole should, as you suggest mean less mixing and disruption of inversion. It really shows the significance of weather in the post 2007 melts. I keep thinking back to K Largo's comments on the forum, from here onwards. It was not a popular idea, but basically my 'take home' from it was that while around the solstice insolation has a big effect on the ice, later in the season, particularly closer to the pole, lack of clouds can actually reduce melt. This season is going to be really difficult to interpret. The likely presence of inversions (not looked at NCEP/NCAR with regards that, open skies later in the season, the lack of pre-conditioning, the role of the PNA pattern in blocking the typical 2007 to 2012 set up - all that is floating around in my head right now. That some 70% of the increased July volume is in ice between 3 to 3.9m thick in the Central Arctic, which accounts for the lack of loss of volume is critical - explain that and I think we'll go a long way towards a wider understanding of this year. Right, I've sorted out the problem I was having with the numbers, the result is the same: comparing volume losses from 1 July to 11 July (early) and 12 July to 21 July (late), what has been odd about this year is that losses of volume in the early period were less than in the late period by a large amount for the Central Arctic and the CAA. Beaufort seemed to match that pattern, with my corrected numbers it doesn't now. Indeed in 2014 only the Central and CAA regions have early losses less than late, all the other regions show the more typical pattern of late losses being less than early losses. Such reversals are not unusual. But this year the Central and CAA regions fully explain the near level losses during the early and late period. Looking to weather in the early period seems to be the most potentially fruitful explanation for this detail of the season. Here's an image from NOAA. Looks like the coldest June/July since 2001 at the surface. Using monthly/seasonal composite Jun/Jul mean air temp cross section from 850mb down north of 80degN, I find no inversion. Using timeseries, Jun/Jul for sfc air temp and 925mb air temp, the difference between those two for the last two years is more like 1948 to 2003, than 2004 to 2012. So except in the period 2004 to 2012 (Dipole tendencies) sfc is always above 925mb - no inversion. However 925mb is at a GPH of around 730m which is perhaps too high? That noted the interpretation I make of 2004 to 2012 is warming aloft, not related to surface processes. But you are correct, whatever the local process causing the cooling it is remarkable!